As with most wonderful activities in Cape Town, it comes down to the wind. While paragliding is technically a year-round activity the likelihood is that you may struggle to find a calm day, The summer months are particularly windy. There are two jump sites in Cape Town, Signal Hill and Lions Head. The site you will jump from is wind dependant North West winds are normally good for Signal Hill. A very light South Easterly with a hot day often allows take off from Signal Hill as well. If there is a good South West Wind then it means Lions Head launch. The launch site decision is only determined on the day by your selected company. Wind changes even during the day, so morning flights could be from Signal Hill only for everyone to move to Lions Head later on in the day. Wear closed in shoes. If you have booked ensure that you bring your booking confirmation or voucher. The pilots all have GoPro’s and you will be able to buy the photos from them at the end of the flight. You can put your personal items securely in the back of your tandem pack. But, just remember it is at your own risk. Upon arrival at the jump site, you will speak to the front desk and determine the location of your Tandem company. You can also make a booking at the front desk if you haven’t already done so. You will need to sign an indemnity form, don’t worry it’s in the pilots best interested to make sure you have a safe flight. You will then suit up and on you are on your way. It was fast, and the entire process from arrival to jump was around 10 minutes. Which is the best company? There are many companies who do Tandem Paragliding in Cape Town. But you want to feel that you are in capable hands. We booked with a great company with many years of experience (my personal guide has been in Cape Town for 16 years paragliding, what more experience could you ask for). I would highly recommend booking with the team at Extremescene. They were easy to communicate with, professional and secured us the best guides for peace of mind. If you are traveling with Ker and Downey Africa we can book any activity for you to save the hassle of finding out whom to go with! You can book on arrival, but when the weather is great then you might miss out! I would recommend booking early in your trip to Cape Town to allow a couple of days if the weather is not ideal on your first booking. As mentioned most activities in Cape Town they are weather dependent so the suppliers are normally flexible for you to move your days (Check your T’s and C’s to ensure you are not going to be charged any administration fees). Should I buy the videos and pictures? Pictures and video costs around ZAR 300 which gives you a memory card you can keep for your own use. Personally, I feel its a once in a lifetime experience. Definitely worth the extra expense. Yep, it is. It’s an adrenaline rush that makes your heart flutter. But more importantly is it worth it? Absolutely! The thrill of challenging yourself to break your comfort zone makes it completely worth it. The view of the mountain and the city before you make it all worth the slight fright as you take off from the runway! 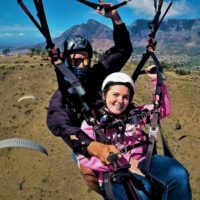 This entry was posted in Blog and tagged Paragliding Cape Town. Bookmark the permalink.